come one, come all. the city welcomes everyone. it's the end of June, and we're here. got a new look for this blog, although it's not how i want but i tried. everything seems fine. holidays almost over. it's all good, i'm content. my name is; the freestyle. what? oh you need help with that? of course! salam folks! how's it going? in this post imma share with you readers a little wonder. most of you have never seen/heard about it, i assume. beautiful aint it? well this is the Morning Glory Pool everyone. and yes, it exists. 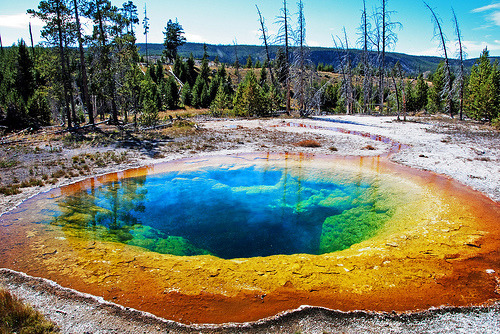 :D it can be found in the US, the state of Wyoming and in the Yellowstone National Park. it's a hot spring with colours! well the colours are there because of the bacteria that inhibits the pool. unfortunately, it is said that this pool is being polluted by tourists. some has been throwing things in it thus altering the overall appearance of the pool. THIS HAS TO STOP SOMEHOW. check it out on Youtube, my channel. the link's on the right of this page. :D thanks. Made by/for AizatHashim. Theme images by Nic_Taylor. Powered by Blogger.